I'm back from Gamescom and just about caught up on my sleeps. 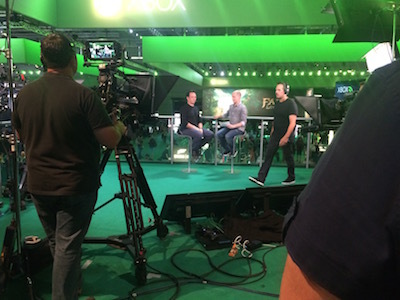 It was fun being part of the Microsoft show. 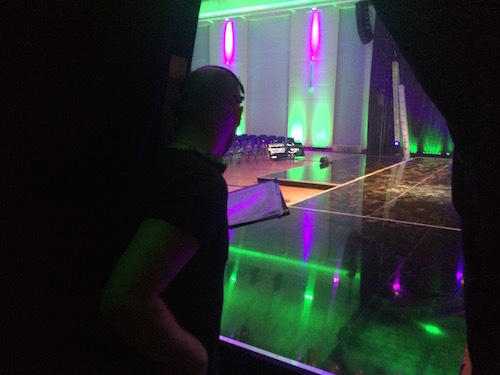 I've never been involved in one of those big presentations before and it was fun to see from behind the scenes. I was part of the indie section and for the most part they didn't let us watch the rehearsals for the rest of the show (they know what a blabbermouth I am). I showed up at 10am and we did two rehearsals and it was deemed by higher powers that we didn't need another one in the afternoon. The whole thing was a little nerve-racking. I don't like giving talks or presentations and I thought this one would be easier since I only had three sentences to say, but I was wrong. When I give a normal 40 minute talk, if I screw up a line, it's one of 1000 sentences, but with this, if I screwed up a line, it was like I'd screwed up ⅓ of my entire presentation. It's odd how much little thoughts like that can worm their way into your head. I became obsessed with not screwing up ⅓ of my talk, and that, of course, made it a lot worse. They also had teleprompters, which I've never used before and you'd think that would make things easier, but it actually worked against me. I had my little speech memorized, but my eyes kept darting to the teleprompters and my brain would panic that I wasn't saying what was being displayed. The first rehearsal went flawlessly. I really screwed up the second one and was hoping we'd get to do another run-through, but it was deemed unnecessary. The second day I got the next two rehearsals right, but I still felt like I was fighting what my brain had memorize and what was being displayed. This was complicated by one of the lines I wrote being changed slightly. I had the world "Lucasfilm" in the second sentence and they removed that for legal reasons, so I was fighting what I had memorized with what was being displayed. Everything worked out in the end and I had a great time. Everyone at Microsoft was great and fun to work with. It's worth noting that none of the Kickstarter money is being used for the Xbox port. The money we got from Microsoft covers the port and there is a little extra to make the main game better. Also worth noting that there isn't a good way for backers to get the Xbox version instead of (or in addition to) the Windows/Mac/Linux Kickstarter platforms. I asked about this to the point of being annoying and Microsoft has no way to mass distribute keys and deal with the accounting of it all. It's something they'd like to do, but they are a huge company and getting (seemly easy) things like this implemented is not easy. It might change in the next year, but it's unlikely. We will keep looking at options, but don't get your hopes up. We just want to be upfront about this. 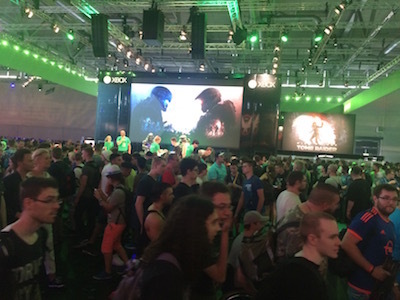 Gamescom was huge. I'm used to E3, but this dwarfed it. 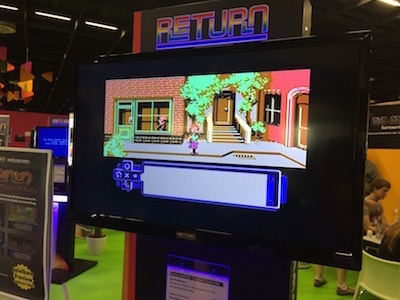 The main show was overwhelming, so I hung out in the retro area and played a brand new point & click adventure on the C64 and did a live on-stage interview. I spent an hour talking to some students and tried to scare them out of getting into games (no luck). 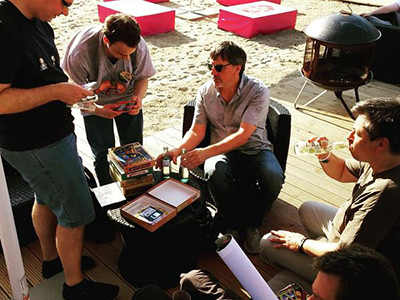 I had a great time at the Adventure-Treff™ party signing Maniac Mansion and Monkey Island boxes, handing out pins and refrigerator magnets, and chatting with everyone. Good times and really good people. I didn't take any pictures except the one of a three head monkey t-shirt. I'm really crappy at taking pictures when I'm traveling so I just stole some from twitter. It's good to be home and working on the game again. P.S. Cologne has a really big church. Not sure if anyone else noticed. A brand new point and click adventure on a C64? That sounds pretty cool right there. Actually the whole thing sounds and looks pretty neat (other than the nerve wracking part, but as a developer, I *HATE* giving speeches or presentations -- and always have). As soon as the number of people goes above like 3 or 4, I start to clam up. On another note, look at all those pretty boxed copies of games! Great stuff Ron! Thanks for sharing. Hopefully all goes well with Microsoft. Btw: acting and remembering lines is pain...i know that very well. :) cant wait for next game updates. 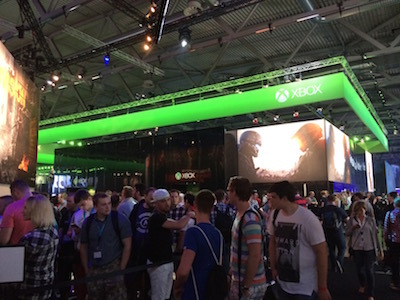 I thought E3 was the biggest there is by the way. 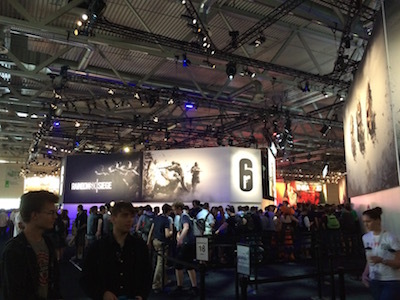 Was Gamescom in the church? I'm glad you got some extra money from Mi(c)ro$oft! E3: "E3 is not open to the general public. 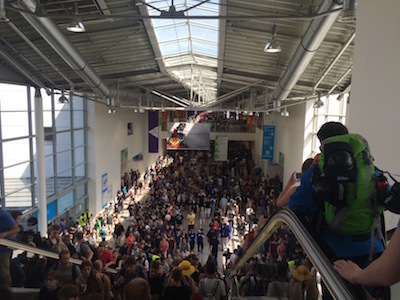 E3 is a trade event and only professionals from the interactive entertainment industry will be allowed to attend." 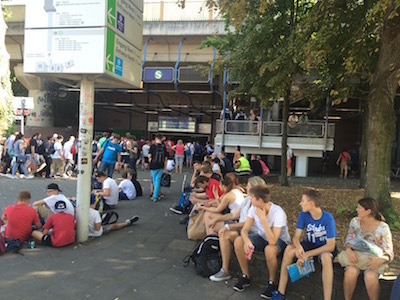 gamescom is open to everyone. Awesome, I also to suffer from *stage fright* . I really love the boxed copies of games, i wish they were easier to get here (signed copies would be great!). Wow! Thanks for all these photos and background informations! It's fascinating to see these old hardware rarities in action. PS: Yeah, it took very long until that cathedral was completed. But it was worth it! Welcome back. Lucky you, you work on a game, and on the kind of game you like most. I code games on my free time only. Never made any adventure game because I only want to code games with a huge replay value. On the other hand, I think that adventure games (or with a very strong story line) are the best. 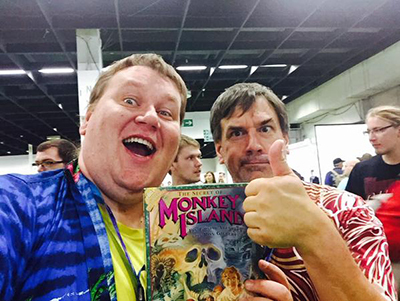 Playing Monkey Island with my best friend during a very hot summer of the 90's will remain one of the best memories in my life. And... yeah... I'll buy Thimbleweed Park in order to make amends of pirating Monkey Island in the first place. That's easy for you to say. Now, how do you make amends for being a die-hard adventure fan yet never having played Monkey Island in the first place?!? You must have misunderstood my (bad) english: I played Monkey Island on my old Atari ST in the early 90's (5 disks and a lot of disk swapping). Monkey Island 1 is my favourite game of all time, along with Civilization. "a brand new point & click adventure on the C64"
Are you not going to share the title??? Maybe a worthy candidate for the Thimbleweed Park Arcade? Yeah, is there anything about it on the internet? Also, was your on stage interview recorded? 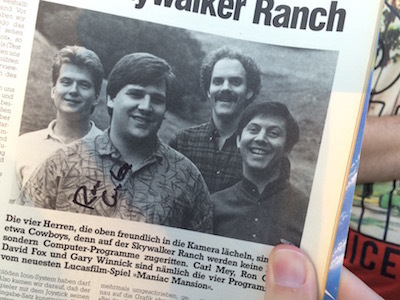 It's a 10 minute interview about Thimbleweed Park (I already posted this link today under the last blog entry but I think it also makes a nice addition to this new entry). 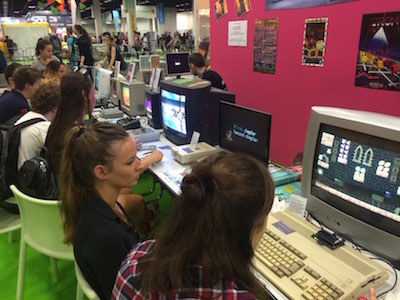 Just a little nitpicking: There was a mouse for the C64, I had one, and I did play Maniac Mansion with it. It was darned slow. I had to move it over the desk 3 times to get from one side of the screen to the other, but it felt a lot better than playing with the joystick. 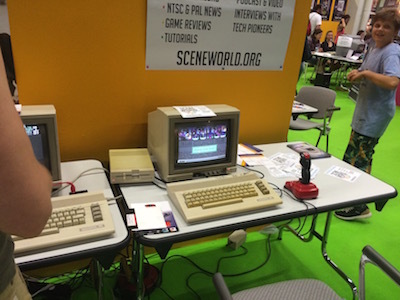 Well, there is also the mouse 1351 which feels like an Amiga mouse - if a proper driver is implemented in the game. Btw Maniac Mansion hasn't, but the fanmade cartridge hack Maniac Mansion Mercury does - unfortunately mouse works properly on pal systems only (http://csdb.dk/release/?id=97811) . Actually the controls for Caren are optimized for using a Joystick with 4-way-commands, compact range for pointer movements and 16x16 pixel minimum size for objects to avoid pixel perfect access. Mouse option is kept in mind for the project, but tbh I don't think that this will be a significant improvement (except faster pointer movements). 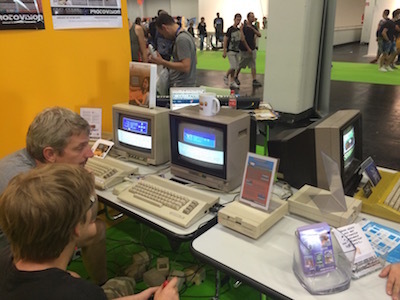 "Heroes and Cowards" is a new adventure game released for the c64 on august 7. But the screenshots look nothing like the game on your photos. 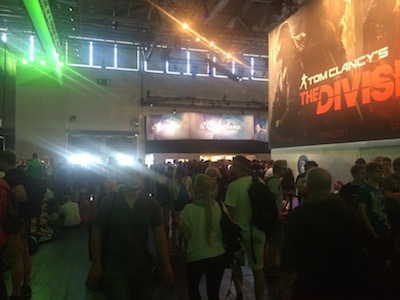 The steelbook edition was sold at Gamescom and it will be available at Protovision very soon! Wow, looks promising. Although I always wonder, with all the work going into a project like this, why make it quasi fanfic. Everybody likes tentacles, but an original story has more chance of becoming something great. 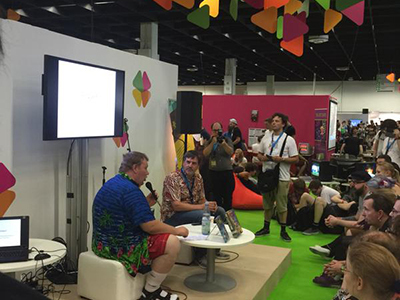 That being said, it was great to see that you had a try with our early version of the game, Ron! After studying your game/engine so intensely that just seems about fair ;-) Not having been there obviously was a mistake. 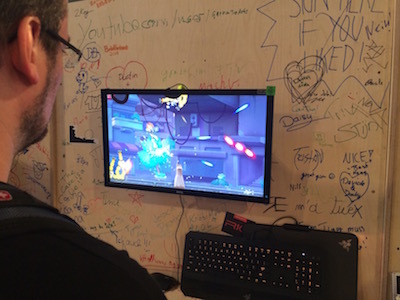 It really rocked -and continuously does so- to face the same issues as you did with ThimbleweedPark (and in fact with MM) such as walking-stuff, blocked passages, text-handling, scripting. There were moments that we were in sync *yay*. Ok, I am of course totally excited and after almost 30 years, it's time to continue this genre also for C64 where it all started : ) What you do remains an amazing source of (legal, in agreement with all copyright considerations and stuff) inspiration! 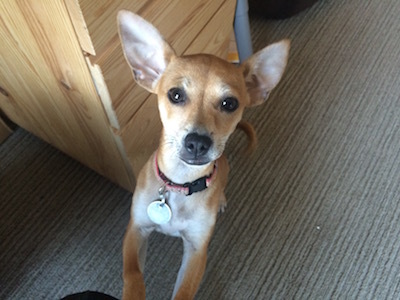 PS: whose TwitterAccount did you take the dog from? 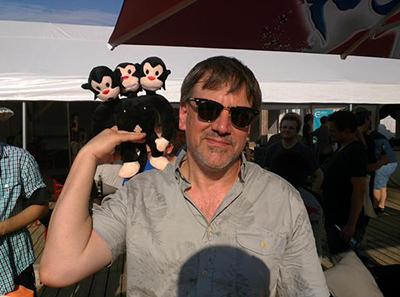 PPS: I finally realize: WE are the three-headed-monkey: code, gfx, music. All the best and the most possible (without posing a health hazard) of fun for your Project. 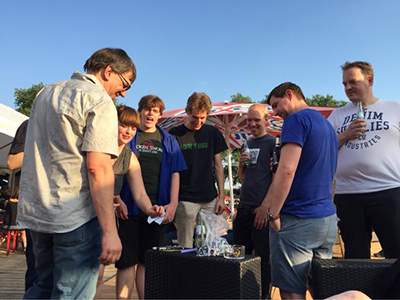 Special Hi to DavidFox for tuning SPUTM and also being responsible for that one other great game for the C64. I like the retro section too. 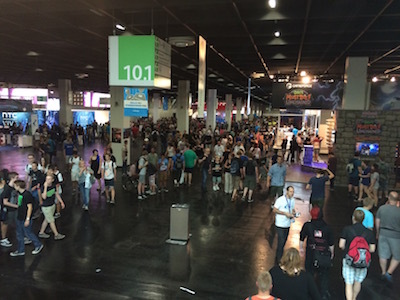 It was my 5th Gamescom this year and this section is really one that brings me back every year. yeah! "My picture was stolen from Twitter and all I got was this lousy t-shirt"
Only it's not a shirt, but fridge magnet. Woooow.... Looks like you had great time there...You really deserved a break! 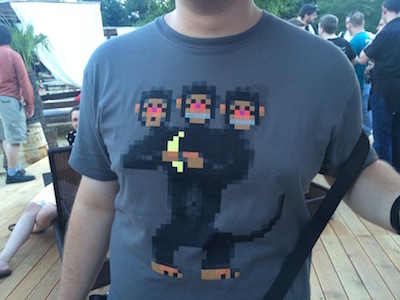 Is there any chance to get a three headed monkey shirt on the web?! Great post Ron! Nice to have an insight of this conferences from a human point of view. Thanks! PS: Talking about humans.....how can I always fail the Seckrit Question?? I've got a notion that the answer doesn't get accepted if you spent too much time on writing the comment. As if the question expires after a while. Then you get a "fresh" seckrit question you respond immediately and it works. The huge Church is called "Dom" and is the Cologne´s Landmark. Glad you had a great time in Cologne :) I´m living about 50 kilometers away from there. Looking damn sharp there Ron! It's rare to see a person actually look better and more vibrant at 55 than 25, and you were not exactly ugly at 25. While I appreciate the compliment, I am no where near 55. Although I am closer to 55 then 25. Helge, he's not 55! But you were close: he's 58. Don't assume Wikipedia is correct. Wikipedia has so many things wrong it is painful. Wikipedia has all three pieces of my birthday wrong, not to mention large chunks of facts about Monkey Island. Reading the stuff about me and MI makes me doubt all of Wikipedia. but Ron looks like 40. Very chiselled. Don't think four years is going to make much of a difference. By then you'll be possibly be even better looking, with triumphant resurgence of adventure games TP will ensue. Very curious: Whatever made you become an "Xbox person" Ron? No, that is where he proclaims to be an "Xbox person". Which I find very curious. No real reason. I have a Playstation but find myself playing the Xbox more. I can't really quantify why. You get used to something and you stick with it for no real reason. But that's not the reason we went with Xbox. Microsoft had a much better deal and were very excited about the game. It felt like we'd get a lot more support from them when the game launched. I was thinking more along the lines of what games you prefer on the Xbox that makes you pick it over Playstation? It's just that I have a hard time coming up with Xbox exclusives that are worth playing, let alone get the console for. With multiplatform games PS4 will almost always win per default due to it's better hardware, one would think. I don't think about it that deeply. I am a PC gamer, so console is just distraction entertainment. I only play games I can buy digitally and a lot of what I like playing is on both consoles, so it doesn't really matter much. Hardware is hardware. In a blind test, I doubt anyone would be able to tell the difference between a Playstation 4 and a Xbox One game. Arguing consoles is a lot like arguing religion: In the end we'll all be dead and none of it will matter. And of course I'm not *just* talking video game hardware here. Yeah, it's a choice with consequences. But the most incisive consequence will be that the game comes out on Xbox, which is a good thing. Microsoft is interested in the game because they have to compete against Sony. And they understandably don't want to lose this competition. As well as they don't want to lose against Apple on the computer market. That's why Windows 10 is free of charge for many customers. If Microsoft had the best deal as Ron wrote, why not! It doesn't seem to be an adhesion contract. I'm sure that Ron has checked the contract terms before signing it. At least a Playstation release doesn't seem to be excluded. A sidenote: as convenient as digital buying is, I really miss those days when game copies came in big boxes with stuff inside. 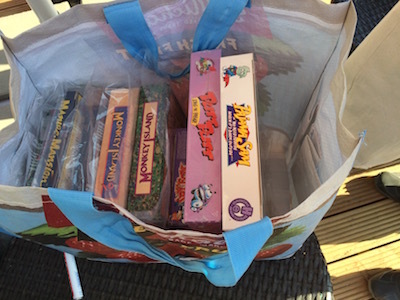 Most clearly I remember when I fetched Indy Last Crusade, Loom, Monkey 1 and Monkey 2 boxes from post office and opened them for the first time. Those were exciting moments. I have all other Lucas adventures too, but for some reason can't remember the day I picked them up. Nothing to do with game quality, as Maniac and Zak are on the top of my list of best games. Anyhow, I have all the boxes in my shelf, and still like to open them every now and then, and it's always fun. BTW, is there a Zak McKracken box that would have same thickness as the other games? My copy is thinner than the rest. Can someone tell me what the game on picture 17 is? It is written "Return" above the screen, but I can't find it with Google. It is 'Caren and the Tangled Tentacle' as mentioned above. 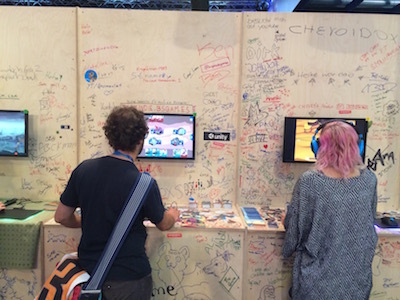 It was playable at the 'Return' magazine booth. It seems to be the above mentioned Caren and the Tangled Tentacles. At least the GUI looks equal. "It's odd how much little thoughts like that can worm their way into your head." The best thing to do in those situations is to take as many drugs as you can beforehand so that you're completely tripping balls when you walk out on stage. Can we see this epic 3-line speech? See the above link by Przemek Zawadzki. I dig the monkey shirt! Although I would love to get my hands on some cool one with LeChuck even more...he is just way too rad. Dear Ron! Will "Chuck the plant" will be in Thimbleweed Park? No, we have something better planned. Did you know that Colognes huge church (the "Dom" ) isn´t hollow? -> It´s all a fake I tell you! 'Veto' is the handle of Oliver Lindau, the gfx-artist behind our C64 game 'Caren and the Tangled Tentacles'. My post was intended as an rely further up the comments. Sorry for this mess. Back to ThimbleweedPark: it is cool that you managed an extra-release for an up-to-date console. Bringing 2d Adventures to those first-person-madness-machines is a win-win for sure. 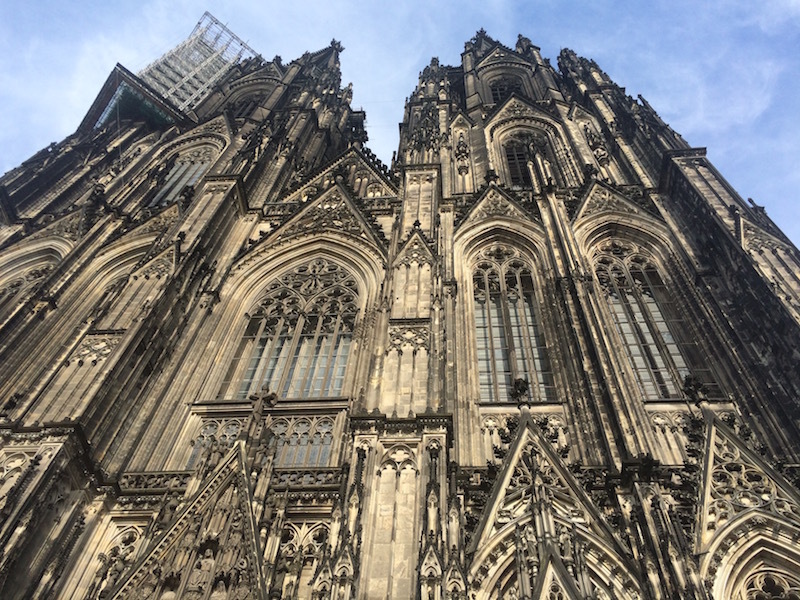 Thanks for the pic of Cologne Cathedral -- is this where the giant occult shop bookshelf is located? (e.g. the one from a previous post with a thousand of user-submitted titles) That would explain why they built the cathedral so tall! The cathedral in cologne is the second highest church in Europe and the third highest in the world. From 1880 to 1884 it was the highest building in the world. It was nice to meet you, Ron. :) It was again the best party of the year. Thanks for showing up at the party! Was a pleasure meeting you. Scratch that, he lost a lot of weight with running and changing what he eats, i.e. Diet & Exercise.